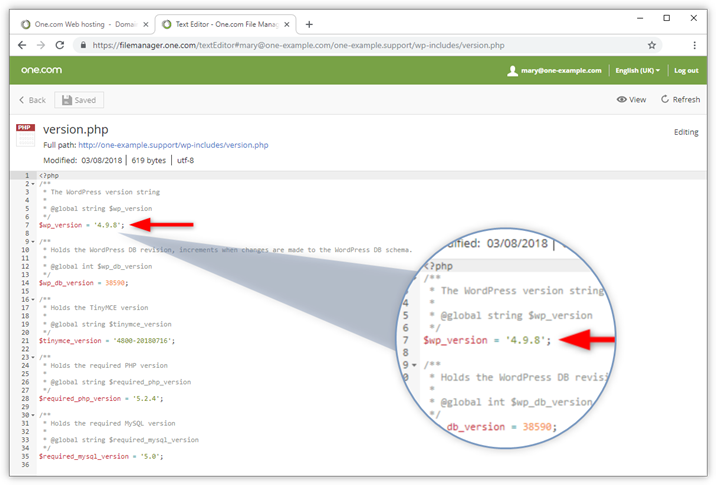 If your WordPress site has stopped working after you updated PHP to 7.2, and you don't have the option to go back to a previous version, then you can follow this guide to make your site working again. Note: If the option to downgrade PHP to 5.6 or 7.0 is still available (until December 3rd 2018), then we recommend that you downgrade PHP on your web space, update WordPress and then update PHP again. Check our guide for step-by-step instructions: How do I update PHP for my WordPress site? The first thing that you need to do is to make sure that your current WordPress version is compatible with PHP 7.2. Log into the One.com control panel and open File manager. Go to the folder wp-includes; it's part of your WordPress installation. Scroll down and select the file called versions.php. Click Edit to open the file in the file editor. Check the version number that is mentioned in line 7. If you have WordPress version 4.9.3, or higher, then PHP 7.2 is supported. If you have an older version of WordPress, then this could be the reason that your site isn't working, and you should do a manual update of WordPress. Check out the following guide for step-by-step instructions: Update WordPress manually. After you did the manual update, you can try to open your site again. If your site is working, continue to step 4 of this guide. If not, continue to the next step. The most common reason for a site not to work after a PHP update is an outdated plugin. So for the next step you need to deactivate all plugins that are activated on your web space. The deactivated plugins will still be there but won't affect your site. Check if you can access your site, after disabling the plugins. If it works, continue to step 4, if not please go on to step 3. If you are using a customised theme on your site, this can also cause problems. To rule this out, you should temporarily change your active theme to one of the default WordPress themes (twentysixteen, twentyseventeen, etc.). You can do this from phpMyAdmin as well. Check our guide for detailed instructions: Change your WordPress theme from the database. You should now be able to access your dashboard in WordPress admin and see your site again, though it will look different. Please, log into WordPress admin. If you still cannot access WP admin, please contact our support so that we can help you figure out what is wrong. Now that you are logged in, you should make sure that everything gets updated to the latest version, this includes WordPress core, all your plugins and all themes. Remove any plugins and themes that you don't need. Tip: Just like WordPress core, plugins and themes need to be maintained and updated regularly. If you notice that a plugin that you have installed hasn't been updated in a while, this might be an indication that it is no longer maintained. In that case, it's better to find an alternative plugin that has the same functionality. Now that everything is updated to the latest version, you can start activating your plugins and theme again. We recommend that you do this, one-by-one, checking each time that your site is still working as it should. If your site breaks after you activated a specific plugin or theme, you can deactivate it again from phpMyAdmin. You will probably need to replace this plugin or theme, since it doesn't seem to be compatible with the latest PHP update.